Marla has over 25 years of experience in church music ministry, directing adult, youth and children’s choirs. She plays piano and organ. 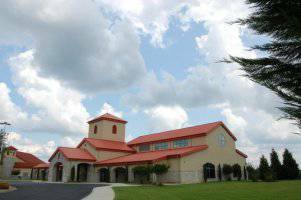 Most recently, Marla was the director for cantors at Saint Albert the Great Catholic Church in Powell, TN where she provided private voice lessons for their cantors. She was also the Youth Choir Director at All Saints Catholic Church in Knoxville. She obtained a Bachelor of Music in voice from Michigan State University and a Master of Music in Choral Conducting from the University of Tennessee. She also studied piano at Michigan State and also church organ at the University of Tennessee. responsible for music selection to support all Masses and church functions, the development of our parish music ministries and the creation of music programs that will challenge the choirs and faithful to grow in their experience and expression of faith. Marla is the music teacher at Claxton Elementary School in Powell. The Music Coordinator is responsible for music selection to support all Masses and church functions, the development of our parish music ministries and the creation of music programs that will challenge the choirs and faithful to grow in their experience and expression of faith.